A unique and stylish three bedroom terrace family home, situated in an exclusive modern development built in 2005 by Bryant Homes, located close to Crawley town centre and railway station. The property which has been totally upgraded and redesigned comprises on the ground floor of an entrance hall with under stairs cupboard and oversized tiled flooring. There is a cloakroom to the side which has a frosted window to front, low level WC, wash hand basin with storage under and partly tiled. 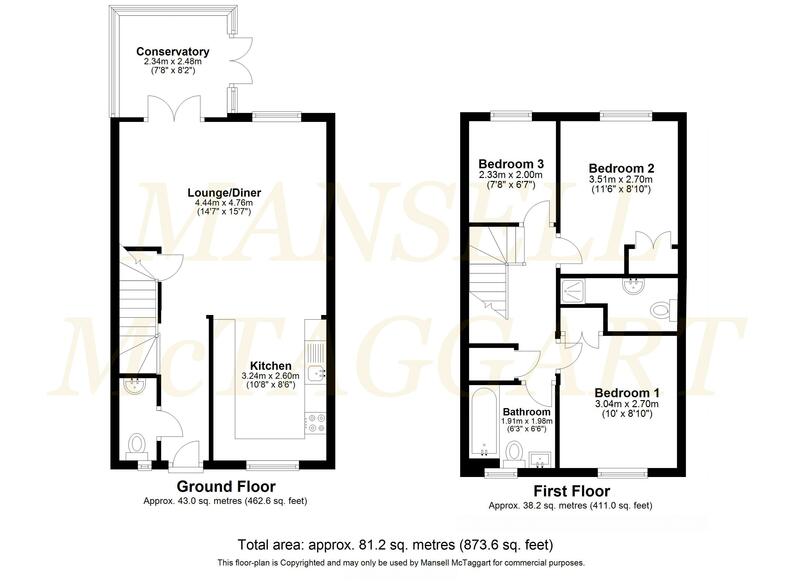 The open plan living room has window to rear and doors leading to conservatory. The kitchen is situated to the front and is fitted with an extensive range of high gloss wall and base units, sink unit, roll top work surfaces, gas hob, electric oven, integrated fridge/freezer, dishwasher, plumbing and space for washing machine and recessed spot lights. The conservatory has a brick base and UPVC construction again with windows to rear and patio doors leading to south facing rear garden. Stairs from entrance hall lead to the first floor landing giving access to all rooms, as well as access to the loft and airing cupboard. The master bedroom has fitted wardrobes and an en-suite comprising of a shower cubicle, low level WC, pedestal wash hand basin and partly tiled. There are two further good sized bedrooms, one with fitted wardrobes and a family bathroom comprising of a panel enclosed bath, low level WC, wash hand basin with storage under, heated towel rail, partly tiled and frosted window to front. Outside the property has pathway leading to front door and side access to a 48’ x 12’ south facing rear garden which is mainly laid to patio and lawn with shrub and flower beds, the whole enclosed by wooden panel fencing. There is a car port providing off road parking for one vehicle with further residential parking on the road. Situated in this popular area on the southern side of Crawley, approximately quarter of a mile from the town centre, with its excellent selection of shops, inns, recreation facilities, schools and railway station (London Victoria/London Bridge approx. 35 minutes). Gatwick Airport and Junction 11 of the M23 are also within easy reach. Schools Hilltop Primary School, Southgate Primary School, St Francis of Assisi RC Primary School, St Wilfrid’s Catholic Comprehensive School.